Hey everyone, so I’ve got a random “bottle” attached to my radiator. 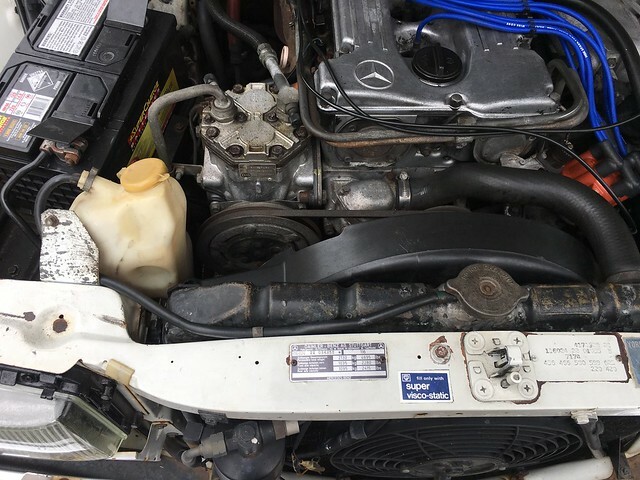 The car is a ‘74 280se so has the old style radiator with the overflow pipe coming out of the neck and down the side. I don’t understand what’s going on here? The bottle has now fluid in it, the temps run at an unflinching 80’c all day. Should I remove it as it does nothing and looks unsightly in the bay. In case of overflow, you would dump toxic coolant on the ground. 2. If you have excess pressure or a leaking cap there's no way to tell immediately since you'd be dumping most of the mixture through the hose and you won't be able to take the cap off if the engine is hot. If you take the car on a long road trip and that bottle gets filled up, you know you've got an issue right away instead of having to wait for it to cool down. Also, if your catch bottle fills up rapidly, it's a good indicator that you could have a cracked head for example. It doesn't need to sit that high in the bay though, you can use a slim bottle and push it lower into the bay. Mine is not visible unless you poke your head inside the bay. I'm a keen cyclist so my idea was to use a transparent bike water bottle with a bottle cage stuck to the frame with zip ties = $5 solution. The bottle just sits flush into the cage and is a lot lower than yours so it's not visible in the engine bay. Because it's transparent, I can just take a peak from time to time to see if there's any coolant in there. I can't remember the cap procedure, I think it's a twist first which releases the cap and potential pressure for safety reasons and then a push and twist to fully release but maybe someone else can confirm. I was thinking it was for environmental purposes but couldn’t understand if it was some sort of modification or Mercedes. I’ll keep an eye on it see if it produces anything. Maybe a new engine project, fitting a clean look hose and bottle instead of the ugly thing fitted. I use a Gatorade bottle in my 240D that is ziptied in. Works like a charm. As for the tank cap, it's half-turn to depressurise, then a push-in and another half-turn to open fully. Do not depressurise above 90°C - it'll end in bad burns, and a wet stinking mess under the hood. Haha never opened a hot or warm radiator cap and I NEVER will. Got it opened was just stiff. Thanks everyone for the info, now I’ve just got to find a nice clean fitment bottle to remove that worn on my engine bay.